I'm having problems to convert JSON data from an API to use on my ListView. On debuging I get "Drawn" objets in the rootobject.drawns list , but they are not being added to my ObservableCollection. I haven't figured out yet the problem. Im currently new at C# and Xamarin, would be nice to get some help from you guys. Hey. Could you post more code, the entire class please. 1. Never (ever) use "async void", use it only when you can't avoid it (ie. events handler), because async void will fail silently if there's an exception, so you could never detect an exception. Use instead Task. You could just have one fuction in your ApiReader that returns drawns and handle caching, let's call it GetDrawnsAsync. Just call the GetDrawnsAsync function in the OnAppearing method on your page. That's all. IEnumerable _drawns; //no need here to have an ObservableCollection, this will be used for caching. public  async Task<IEnumerable<Drawn>> GetLastDrawnsAsync() // Try follow C# naming conventions, methods should you "CamelCase" lettering, only local vars should be named like "localVar"
return _drawns;                             // you can add some logic refresh caching based on last time we fetched results. response.EnsureStatusCodeSuccess(); //I'm writing this in the top of my head, not sure what's the method name, we use this to be sure that our request is successful, else it'll throw an exception! //and this illustrates why we should never use async void methods, because this exception will be "swallowed" and we can't know if the request succeded. //The request failed!! we should perhaps show a friendly error message to the user, and log it for eg. I wrote this on NotePad++, so not sure if it compiles straight forward, but if there's any problem it should be easy to fix. Although we are defining initializing _drawns as a List it is not allowing me to use the "Add" methode because we are defining it as a IEnumerable on the class. Was it supposed to happen or am I missing something ? Sorry for this basic questions and really thanks for your help. BTW did the code work? The code indeed work. Really thanks for help! Hi @nadjib Im having the same problem. I follow the codes you wrote above to implement in my json data but still no success. 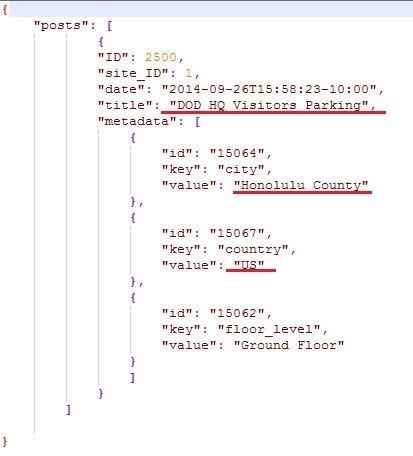 Below is my sample json data, i want to get the "value" of the "key" object if string is CITY inside the "metadata" which also inside the "posts". Here are your C# json converted into classes. var result = JsonConvert.DeserializeObject<RootObject>(jsonString); // you can access all properties and values using result object. @nadjib I am trying to get those values (underlined in red) to bind with my listview. So far here's what I've done but nothing of success yet. It will be better to flatten the data to a single DTO class to make it easier for binding. Great! Thanks @nadjib , your code works.